Karn in Mahabharat: The king of Anga. Whenever this name comes into mind some best qualities and inspirational things will come into mind. His role in Mahabharat was very very crucial and played an important role in throughout this great epic. He was called as 'suryaputra' because he was born to Lord Sun and Kunti. Even though Karna was the eldest of all Pandavas but his birth was kept as a secret by his mother Kunti otherwise Karna was the first person to be elected as a king for the throne of Hastinapura. He has sacrificed everything he has in his life and always remained as the symbol of friendship because of his great friendship with Duryodhana. 1. Why Karn in Mahabharat called as "Vasusena" and "Radheya" and "Suryaputra"
Rather than named as Karna he was also called as Radheya because, after his illegitimate birth, his mother Kunti put him in a basket and set him to float on the river. Then Adhiratha, who was charioteer of Dhritarashtra found the baby. Radha was the wife of Adhiratha. Both Adhiratha and Radha raised Karna as their own son. He was raised by his mother Radha so he was called as "Radheya". Both Adhiratha and Radha named Karna a name called Vasusena. So he was called as "Vasusena". But actually, he was Born to Surya and Kunti so he was called as "Suryaputra". Actually, Karna was cursed by three different persons because of his three different incidents which made his fate worse. 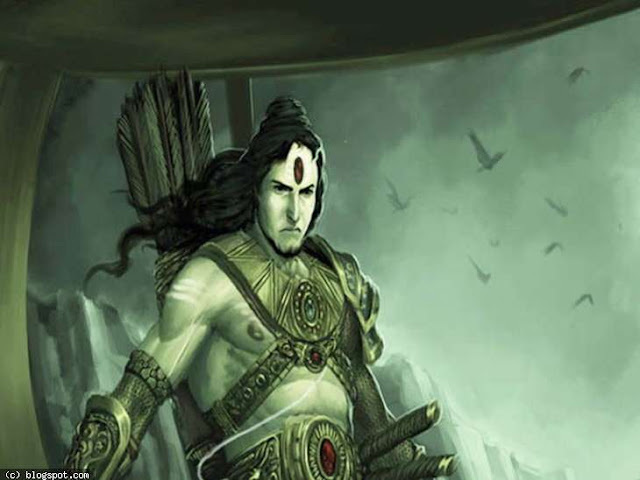 a) PARASHURAMA: Karna was cursed by Parashurama who was the guru of Karna in Mahabharat because Karna tried to learn archery skills from Parashurama by saying that he was brahmin but when after Parashurama came to know that Karna lied with him, Parashurama cursed Karna that he would forget all skills what he learned from him. b) BRAHMIN: Karna once killed one cow with an arrow which was rushing towards him. The owner of the Brahmin cursed Karna as he would become helpless in an important part of your life because killing a cow is illegitimate because the cow is always worshipping as a god in Hinduism. c) BHU DEVI - THE EARTH GODDESS: Karna once saw one girl was crying. Karna asked a small girl why she was crying, she told that she split ghee on earth and her mother will scold her if she will not go with ghee. Karna tried to give her new ghee but she refused and wants the ghee which was mixed with soil on earth. Karna tried to squeeze soil and extract ghee and started pouring it back into the bowl. This caused severe pain to BHU DEVI and she cursed him that his chariot wheel should be struck in the earth when was fighting in crucial part of the war. 3. Who was great sacrificer either "Karna" or "Yudhistira"
Lord Krishna always used to praise the greatness of Karna in front of Arjuna. Once Krishna called Karna as great sacrificer than everyone, this hurt Arjuna because he knew Yudhistira was best in that. So Arjuna asked Krishna how Karna would be better than Yudhistira. Then Krishna wanted to show Arjuna practically so both Krishna and Arjuna changed themselves their identities into Brahmins and they went first to Yudhistira and asked wood for cooking food. But Yudhistira failed to give because at that time it was raining heavily so Yudhistira failed to find dry wood suitable for cooking food. Then they went to Karna but Karna also not able to find dry wood but with the help of his bow and arrow he destroyed all the doors of his court and gave that wood to them. This made Arjuna know how much great sacrificer was Karna. Before Kurukshetra was going to commence, to avoid the war Krishna god asked Karna to become the king of Hastinapura because he was elder than Duryodhana and Yudhistira but Karna simply refused Lord Shri Krishna's request and said that he would not betray his great friend Duryodhana and he would fight from Kauravas side only for the sake of Duryodhana. Even though he knew Pandavas were his little brothers but he was ready to fight with them and kill them in the war because of his friendship with Duryodhana. That's why he was regarded as the great friend in history. Both Duryodhana and Karna were regarded as greatest friends in the epic. Kunti did not want Karna to fight with his own brothers nothing but Pandavas and she wanted to save her sons from the great Karna so she met Karna and revealed the real secret of his birth and told she was his real mother. Kunti asked Karna to not fight with Pandavas but Karna refused her desire because he has to fight for the sake of his friend Duryodhana in the war. But he gave her one boon that he would not kill remaining four Pandavas except Arjuna even though he has a chance to kill them. He fought with Arjuna only in the war. Readers, This is all about the greatness of the great warrior and sacrificer Mahabharat Karan, if you know anything more than this things, then comment in the comment section below to share your knowledge to all people over the globe.